By A Woman's Guide to Treatment Michael H. Safir, M.D., Clay N. Boyd, M.D., Tony E. Pinson, M.D. Michael H. Safir, M.D., Clay N. Boyd, M.D., Tony E. Pinson, M.D. 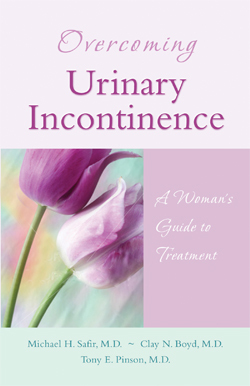 Eleven million woman experience urinary incontinence. Although it can occur in women at any age, 35 percent of women over age 65 experience incontinence. Unfortunately, half of these women do not discuss the matter with their doctors because they are embarrassed. In more than 80 percent of cases, treatment can improve or cure the problem.